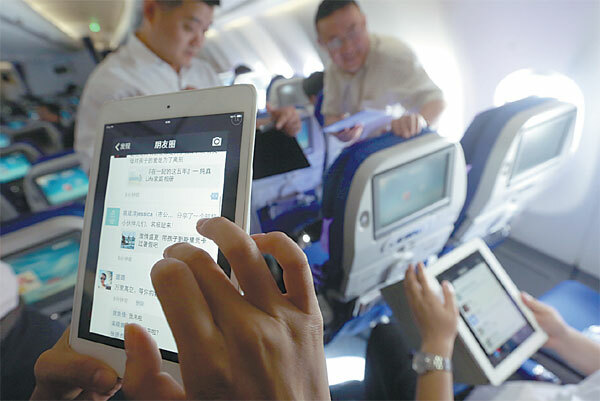 Three major Chinese airlines, including China Eastern Airlines, China Southern Airlines and Air China, have been approved to provide in-flight Wi-Fi services. Passengers on these airlines won't have long to wait before they can log on and stay plugged-in during their flights. China Eastern Airlines has become the first Chinese carrier to provide Wi-Fi services on both domestic and international flights. According to the Ministry of Industry and Information Technology, the carrier is allowed to use the AsiaSat-6 satellite for Wi-Fi services on its 21 aircraft from June 5. The services are expected to be offered in a month as the airline clears up several formalities ahead of the launch. Zhang Chi, deputy director of the company's transition department, explains what this means for the airline. "According to our market research, over 86 percent passengers will take flights with internet services as a priority. So providing wifi service is an important strategy for the company to attract passengers, and that's why we've decided to make this a standard service in our entire fleet. To make it happen, over 70 aircraft will be modified to install the necessary equipment before 2017." After the installation is completed, through the AsiaSat-6 satellite, airplanes in the sky can get connected with network devices in base stations on the ground. China Southern Airlines' senior engineer Mi Jisheng says the state-to-the-art technology enables air passengers to experience faster wifi service on plane than even at home. "First, with the new technology, the bandwidth will be about 50-fold faster than that of the previous traditional technology. Second, the communication network will be much larger than before, and this time with global coverage. About 99 percent of intercontinental routes will be covered with satellite signals."